We use a variety of ways to raise funds for the school. A JustGiving page found at – https://www.justgiving.com/ysgolcrugglas/donate Anyone taking part in a sponsored event can open a page linked to our Friends account for sponsorship. Gift Aid is then claimed on the Friends behalf by JustGiving and credited to our account. 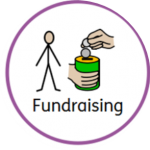 eBay – The Friends are also registered as a recognised charity on eBay , so funds can be contributed whenever you sell an item. Rags 4 Riches clothing collections – keep an eye out for dates for this. 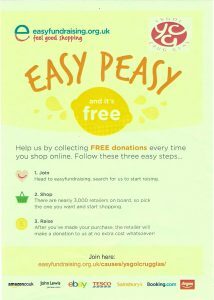 easyfundraising.org.uk – do all your online shopping via this website and a small percentage comes to the school…it all soon adds up.